In the last month alone, the Orange County Corrections Department has donated 500 pairs of obsolete but brand new cargo-style uniform pants to 10 different area nonprofit organizations—among them the Coalition for the Homeless, Pathways Drop-In Center and Great Oaks Village. 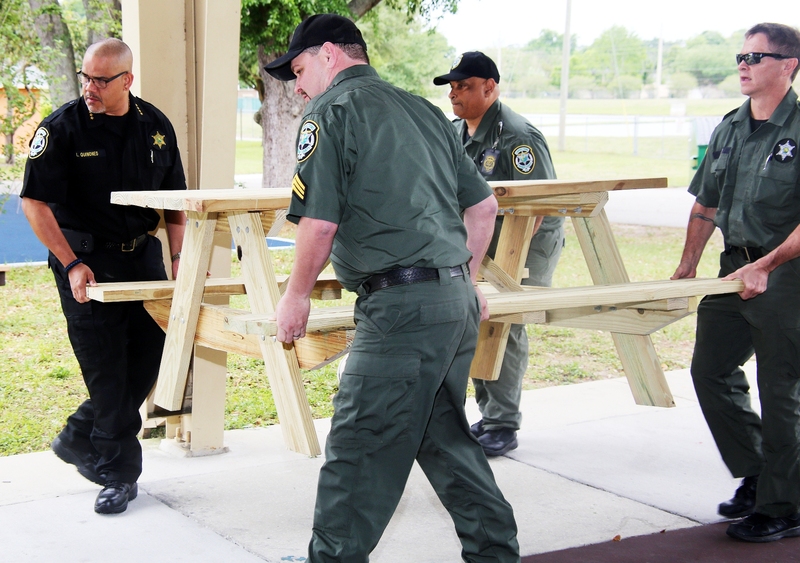 And on April 1, the department was back at it again with another visit to Great Oaks Village—this time with a special delivery of furniture built by inmates in the jail’s construction program. The donation included Adirondack chairs for the library, picnic tables for the covered basketball court and a bookshelf for one of the campus offices. Great Oaks Village is a foster group home for children who have been removed from their homes by the State of Florida. It serves children and teens with nowhere else to go. The majority of its residents have been abused or neglected. Dr. Tracy Salem, Manager of Youth and Family Services for Orange County, couldn’t be happier. “We are so appreciative of this donation and our wonderful partnership with Orange County Corrections. The campus will get great use out of the new furniture,” Salem said. Alex Amarante, one of the inmates who helped build the donations, said he was touched to be able to contribute to such a meaningful cause. Each graduating construction class completes a give-back project to donate to a local cause. “In the construction program, inmate workers learn new skills while they give back to the community in a positive way,” said Chief of Orange County Corrections Louis A. Quiñones, Jr. The agency also recently sponsored several seats on the bus for students participating in the YMCA’s Teen Achievers Annual Spring College Tour for 2019. Chief Quiñones said the Corrections Department has been a longstanding supporter of the Teen Achievers Program to propel students toward success and to keep them from getting involved in the criminal justice system. The Orange County Corrections Department has also put together a team for the Upcoming NAMIWalks at Crane’s Roost Park in Altamonte Springs on Saturday, April 27. NAMIWalks events bring together people of all ages to combat stigma, raise funds and promote awareness of mental illness. Since nearly 40 percent of inmates have some sort of mental health issue, the cause is near and dear to the Corrections Department. Visit the team’s online page to participate or support the effort. Deputy County Administrator of Public Safety Danny Banks is pleased with and supportive of such efforts. “A culture of giving back is not only one of the most inspiring ways to engage staff, it also offers Orange County employees the chance to stay connected to and respond to the needs of the community,” Banks said.